3 Tips To Make Procreate Brushes Look Just Like The Real Thing! 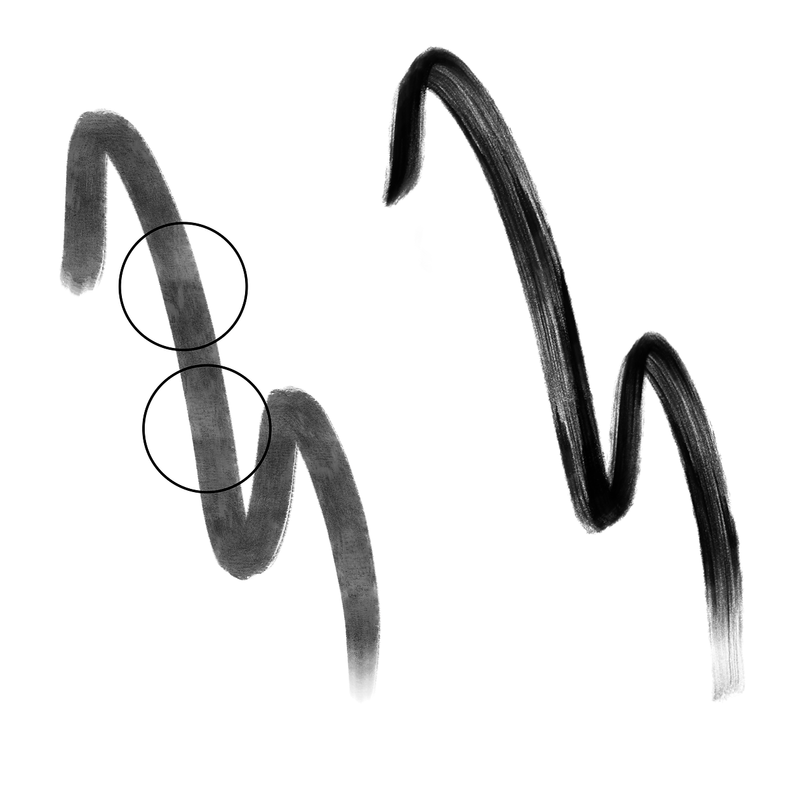 One of the most important features I try to put into all of my brushes is to allow complete and total control of how the brush looks and works. Control over the size and opacity of the brushes are something that everyone wants in a brush, but as well as these, other functions such as the depth of the grain and the softness of the brush edge are something I regard as being equally important in my brushes, as I think these are the features that invoke the most authenticity. The above image demonstrates how this brush ('Wide'- Gouache for Procreate) is controlable by using pen pressure, making the brush more or less opaque, whilst still keeping the texture and clarity of the grain. This makes the brush much more pleasant to use, as well as adding to the authenticity of the brush. A LOT of Procreate brushes available rely heavily on scanned textures stretched out and repeated to give an impression of the texture of the media it's trying to recreate. And whilst there's nothing specifically wrong with this, I think that for professional illustrations, repeated textures simply don't cut it. With my brushes, I try to use the shape source to dictate the look of the texture, and use the texture source to overlay and complement this, without it being directly obvious. This technique works around the issue of repeating textures, and makes the brushes look and feel much more realistic and true to the intended media. In this image, I have compared the Default 'Gouache' Brush in Procreate with the 'Wide' Brush from my Gouache for Procreate pack. 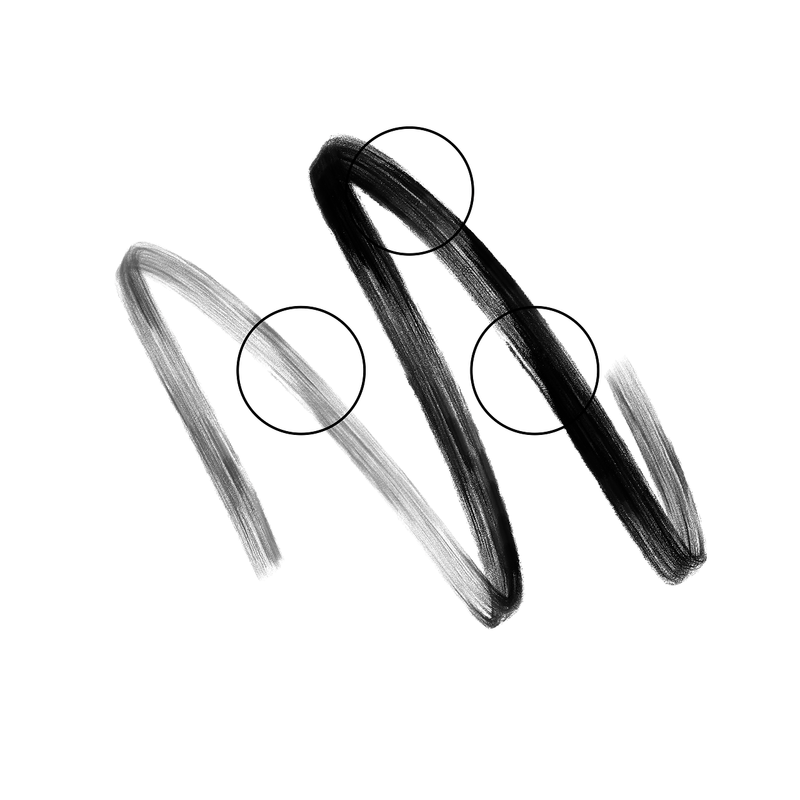 The circle borders point out the repeating textures in the brush, which on a small scale, such as one brush stroke, is not that noticeable, but with larger planes, this can become an immediately obvious issue. The 'Wide' brush, has no repeating texture, and retains consistency throughout the whole stroke. Natural media can be pretty unpredictable at times, and whilst this can sometimes be a nuisance, it brings so much charm to our work as artists and illustrators. This is something I try to get in ALL of my brushes, a random thick streak of paint, random drop-offs in load on an inking brush, or an extra spot of pigment you didn't intend to be there can all add so much character and authenticity. The best way I have found to do this is using texture sources to add/ subtract pigment and altering grain settings and bleed to add an element of control to it. This is quite a time consuming task, as Procreate's brush creation interface can be quite rigid and doesn't really allow for natural media replication without a lot of fine tuning. In this image, I have pointed out, parts of this single stroke which stand out as anomalies. A simple addition or subtraction of pigment from the stroke at certain points really increases the authenticity of the brush, replicating what would happen with the natural media! Drop me a message if you'd like to know more about making brushes! Im thinking of making a series of videos demonstrating how to make some brushes as well as what makes them work! Don't forget to follow me on Instagram for more info and offers on my brushes!